Each and every year, the buildings in our district convene Safety Committees, comprised of administration and staff, to examine our protocols, facilities and daily practices. Some years, the changes we make are hard to notice as it might just be procedures or policies, but in other years, the changes are more visible to the public. This year, we have a VERY visible change at HHS that has been completed and is now operational. Our building was constructed more than 50 years ago, so making the facility fit modern expectations can be difficult. But at HHS, we adapt and work through these difficulties by finding new options. In the past, we’ve needed to keep a door on the south side and on the north side of the commons open for people to get to the office, which doesn’t really fit with the security needs of today’s schools. However, we now have a digital lock system that allows us to keep ALL doors locked during the school day. A doorbell is available that sends video and audio to the office when visitors want to come in. From the office, we can use a digital release to allow people into the building. 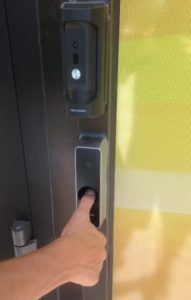 Students have the ability to enter during the day by using their thumbprint on a biometric system that unlocks the door long enough for them to open it. This is not the final change we will make to our security practices at HHS, but it is one that our public will notice as they visit our building. As always, we encourage our patrons to contact school officials with concerns and ideas about how to address them in the area of security. Safety at HHS must be a cooperative effort, as school employees, students, parents and patrons all share responsibility in making it a safe, secure place to educate our youth.